You are about to embark on a grand tour through 500 years of Dutch Design. Amsterdam is the cradle of creativity and home to some of the most innovative architects in history. From Barbados to St. Petersburg, and from Cape Town to Gdansk; step gables, neck gables and clock gables can be found all over the world. 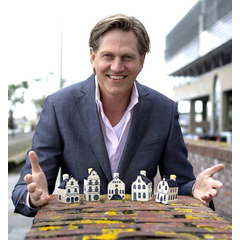 They are the calling cards of Dutch architecture. 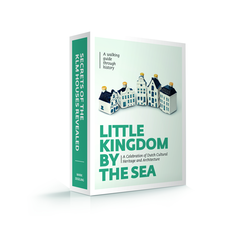 The coffee table book ‘Kingdom by the Sea’ contains the amazing stories of more than hundred monuments which modelled for the miniature houses of KLM Royal Dutch Airlines. With its Delft blue collection, KLM pays homage to Dutch design of timeless significance. Your tour guide will take you on a journey through time, along the beautiful canal houses and landmark buildings which served as an inspiration for the iconic KLM collection. Are you ready to meet some of the greatest names in Dutch architecture?